CRDC is pleased to announce a recent loan closed with business owners, Walter and Chris Chapin that allowed them to purchase the building they were leasing resulting in reducing their overall occupancy costs. CRDC is non-profit development corporation that provides a variety of economic development services and small business loans to businesses and local governments throughout New Hampshire. Company C is a top manufacturer of distinctive rugs, bedding, furniture and decorative accessories with over 1,000 dealers worldwide, three exclusive retail stores including the company’s headquarters in Concord. With a ten-year lease coming to an end, combined with the need to expand, Company C co-owners, Walter and Chris Chapin began to explore their options for managing the future growth of their premier design studio. They knew it was time to not only own their own building, but increase the existing footprint of the corporate office. 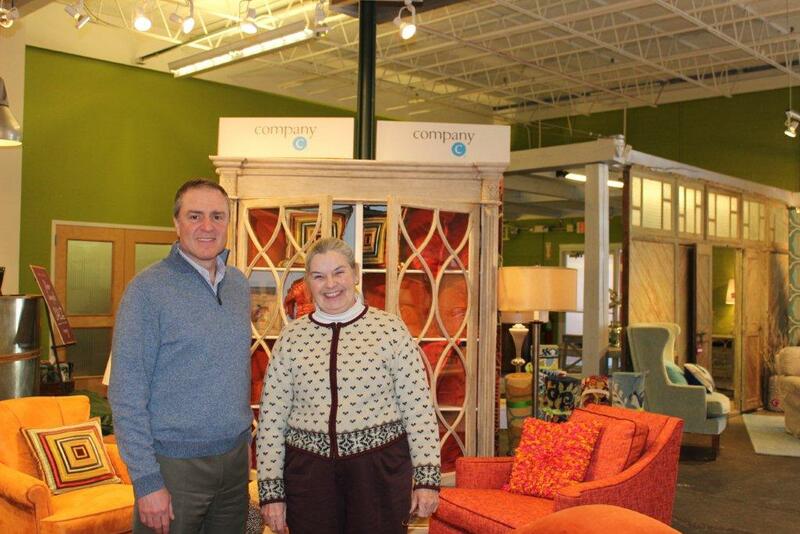 Since its inception 20 years ago, Company C has always had its corporate office in Concord. While the both are loyal to their hometown, Walter and Chris knew they had to expand their search and look outside the Capitol City. After several months of searching for a new building, they decided to explore the option of purchasing the building they were leasing in Concord. It wasn’t for sale, and it was far from being energy efficient but they had an idea. CRDC collaborates with multiple banks to facilitate the lending process for companies looking to expand their business by purchasing real estate, new equipment or for those purchasing a new business. Walter Chapin, Company C co-owner with Liz Sweeney, CRDC Loan Officer at Company C’s Concord, N.H., corporate office and retail store.